Tower blocks in Belfast's New Lodge have already been earmarked for demolition by the Northern Ireland Housing Executive. THE Northern Ireland Housing Executive may be forced to allow half of its 86,500 homes to fall into a state of disrepair from 2020 if it cannot secure additional funding, The Detail can reveal. The social landlord is to begin planning “for the longer-term decommissioning” of over 43,000 properties from the start of next year if a solution cannot be found to plug an estimated £140m annual budgetary shortfall. 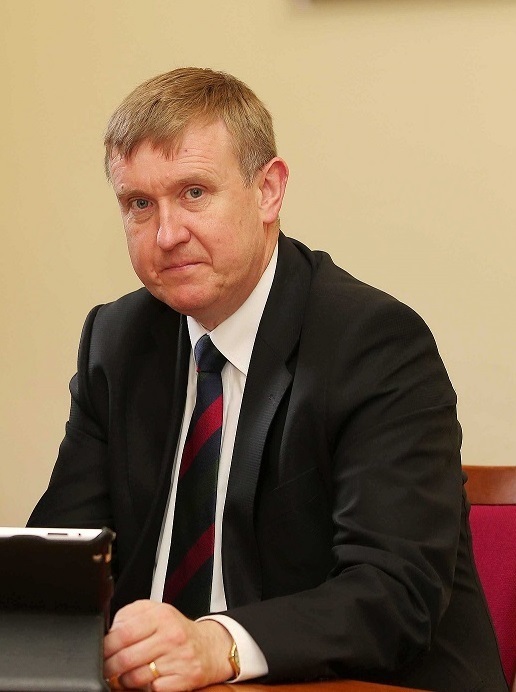 This will allow the Northern Ireland Housing Executive (NIHE) to prioritise the maintenance of the remainder of its homes, according to a letter written by Department for Communities (DfC) permanent secretary Leo O’Reilly. However, there are fears that such a move would put pressure on housing waiting lists and increase homelessness. Last week The Detail reported that 148 people registered as homeless died while waiting to be allocated a house by the NIHE between October 2011 and the end of August 2018. There were 36,198 applicants on a waiting list for a home in Northern Ireland in March this year with 24,148 of those considered to be in priority need of housing and 11,877 deemed to be homeless, according to the NIHE’s latest annual report. NIHE’s financial difficulties are being blamed on low rental income, debt and management costs and a repair backlog. The August 6 letter from Mr O'Reilly, which was sent to DUP MLA and former Social Development Minister Mervyn Storey, outlined a number of potential solutions - but these require legislation to be passed. Warning that “stock continues to deteriorate due to lack of investment”, the letter added: “The NIHE has sought to manage this position through a process of focusing on essential maintenance of its properties while curtailing the longer-term maintenance that is essential to ensure the longer-term availability of the housing stock. “Towards the end of 2017, the NIHE estimated that if by 2020 there was no prospect of the future investment that reform may secure, then the organisation would have to start de-investing in approximately half of its portfolio in order to provide a sustainable future to the other half. The NIHE told The Detail the de-investment plan is the “worst case scenario”. A spokesman said this “potentially would mean that we continue to focus only on necessary health and safety work and halt improvement schemes” on some properties and that it could take around three years before there is a detrimental impact on its homes not subject to investment. He said: “Options that could be explored would be the possible sale of homes to the private sector, transfer to housing associations, or demolition and redevelopment. While in some cases this may be feasible, it is our experience that there would be a great of deal of difficulty in getting agreement from tenants, local communities and political representatives to the transfer of stock. DUP MLA Mervyn Storey was Social Development Minister between September 2014 and January 2016. DUP MLA Mervyn Storey told The Detail he raised the problems facing the Housing Executive with former First Minister Peter Robinson and former Deputy First Minister Martin McGuinness more than two years ago when he was the minister responsible for housing at Stormont. The idea of decommissioning homes has been met with opposition from a leading human rights group which has accused the Housing Executive of “blatant opportunism” in the absence of a functioning government at Stormont where there has been no Executive since January 2017. Dessie Donnelly, from the Participation and the Practice of Rights (PPR) group, said: “The delivery of accessible and affordable public housing is a basic human right. He added: “The prospect of an unelected and unaccountable civil service taking this decision now is wholly unacceptable. 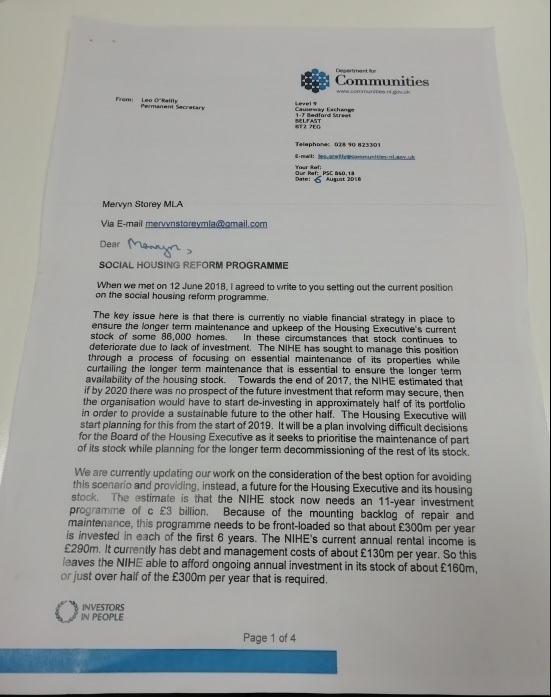 In his letter to Mr Storey, the DfC permanent secretary said the NIHE believes it requires a £3bn investment in its housing stock over 11 years and that a backlog of maintenance and repair work means an annual investment of around £300m is required for the first six years. However, because of debts and management costs worth around £130m a year, the NIHE can only afford just over half of this estimated £300m investment from its current annual rental income of £290m, he added. Department for Communities permanent secretary Leo O'Reilly wrote to DUP MLA Mervyn Storey in August. Providing the NIHE with access to additional capital funding, either by the Northern Ireland Executive diverting funds away from other capital projects – which Mr O’Reilly said would be “difficult” and that the executive had not directly invested in social housing on this scale before – or by increasing its borrowing powers which would require a reform of the current NIHE structure and a sufficient rental income. Increasing property rental rates which have remained frozen since 2016 at around £66 a week. Amending legislation so the NIHE is no longer required to pay corporation tax which was introduced in 2012. The body’s tax bill for 2018/2019 is £7m. NIHE’s debts being written off by the UK Government. 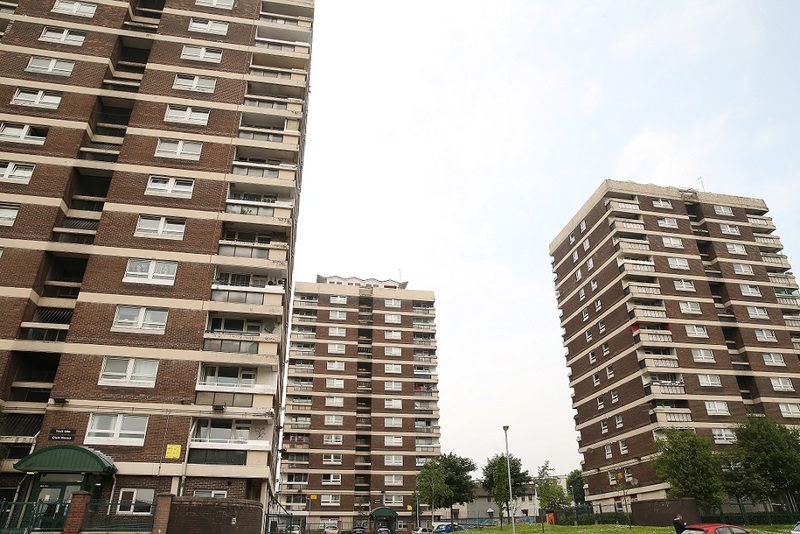 The NIHE is currently consulting with residents living in 1,931 flats across 33 tower blocks over plans to demolish the buildings and erect new accommodation on the land over a 20-year period. Last week DfC permanent secretary Leo O’Reilly said one option that could help secure the future of the NIHE is if it is converted from a public body into a social enterprise-type organisation. He told delegates at the annual conference of the Northern Ireland Federation of Housing Associations (NIFHA) in Limavady last Thursday that this would mean it could be eligible to apply for private sector funding which public bodies cannot do. He said the new organisation would be similar to a registered housing association although the final model had not yet been finalised and would require ministerial/executive approval. Mr O’Reilly also told the conference that around £7bn of investment is needed for Housing Executive stock over the next 20 years. The NIHE's 2017/2018 annual report said building started on 1,759 new homes during the last financial year through the body’s Social Housing Development Programme Group. However, the NIHE told The Detail it last built a new home during the nineties. Update (February 2019): The NIHE has since confirmed that its last new social home build started during the 2000/2001 financial year and the last new build completion was during the 2002/2003 financial year.